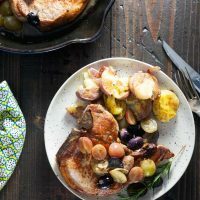 Pan Roast Pork Chops with Grapes (Whole 30) | Healthy. Delicious. 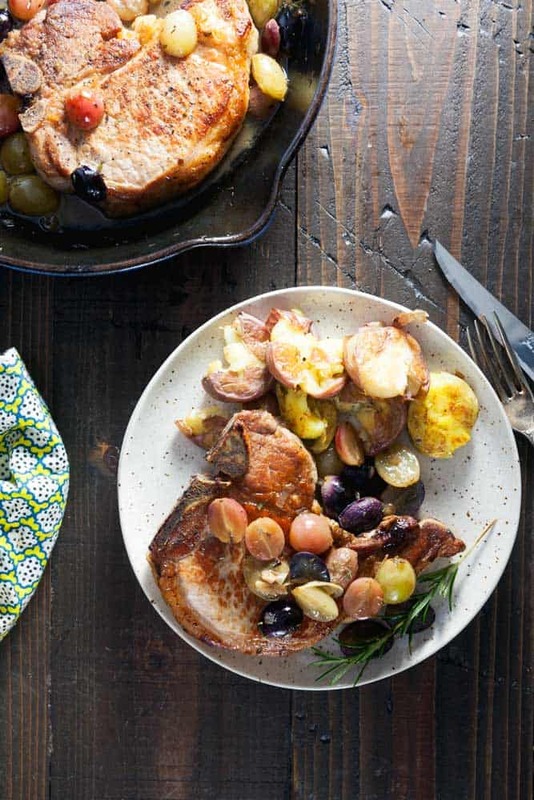 Juicy pan roast pork chops with grapes are a delicious – and easy – meal that will warm you up this winter. Serve them with potatoes, mashed cauliflower, or crusty bread to soak up the extra pan sauce. You wont want to leave a drop behind! What are your feelings about combining meat and fruit? I know it isn’t everyone’s thing, but I’m a big fan of adding fruit to savory recipes. As long as you keep the flavors balanced, fruit can add a nice layer of sweetness and bright flavor to your recipe. I especially love cooking with grapes because they aren’t too sugary or syrupy. They’re delicious with braised chicken, on pizza with goat cheese, or with these hearty pork chops. I bought a big container of green, purple, and red grapes for these pan roast pork chops. I love the beautiful colors and I’ll have tons of grapes left over to snack on throughout the week. You don’t have to get that fancy though – any seedless grapes are ok in this recipe. 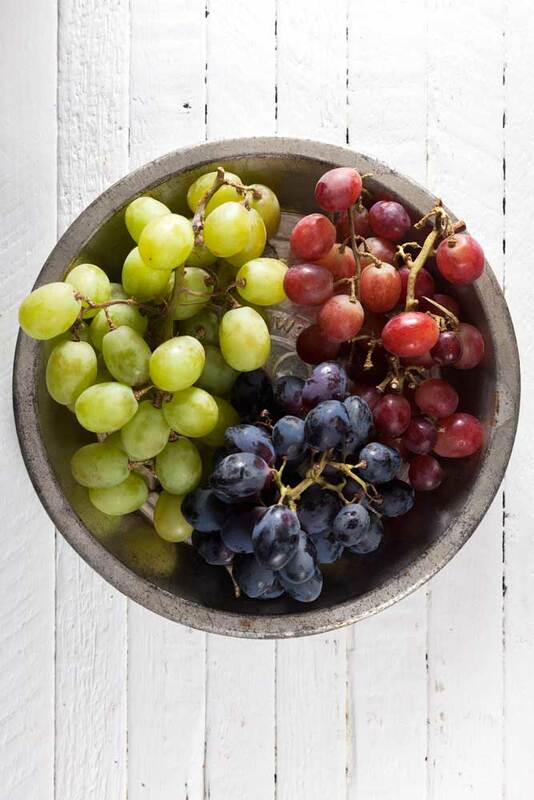 Green grapes have a cleaner, bright flavor while the darker ones have a deeper, jammy thing going on. Either way, you can’t go wrong. When it comes to the pork chops themselves, I like a thick, bone-in chop for this recipe. Sear the pork in a cast iron pan (this one is my go to) then transfer them to a hot oven to finish cooking. This will give the chops a nice, golden brown crust without overcooking them. They’ll stay nice and juicy inside! Heat the olive oil in a cast iron pan set over high heat. Add the pork chops and cook 3-4 minutes per side, or until deeply browned. Transfer to the oven and roast 8-10 minutes, or until cooked through. Remove the pan to the oven and transfer the pork chops to a plate to rest. Pour all but 1 tablespoon of fat from the pan and return it to the stove. Add the shallot and garlic and cook over medium heat until softened, 3-4 minutes. stir in the rosemary and thyme and cook 1 minute. Add the chicken stock and bring to a rapid simmer; let reduce for 1/3. Stir in the butter, if using. Add the grapes and cook 2-3 minutes, or until warmed through. Serve the grapes and sauce over the pork chops. To keep this recipe Whole 30 compliant, omit the butter. The sauce won't be as velvety, but it's still incredibly tasty! Each pork chop will serve two people. This is such a pretty dish! I love pork chops and the flavors of these sound amazing! I like the meat and fruit combo is a delicious pairing! I love pork chops with apples. I’m sure pork chops with grapes is even tastier! What a delicious idea to use roasted grapes. I bet their sweetness makes the pork chop amazing. My husband is a huge fan of pork chops! This will be a great dish to make for him! Thanks for making this Blog ! LLL Healthy tips are more interesting and informative till the end! Keep inspiring us. It looks delicious! I’m always looking for new Whole30 recipes that my family will love as well! 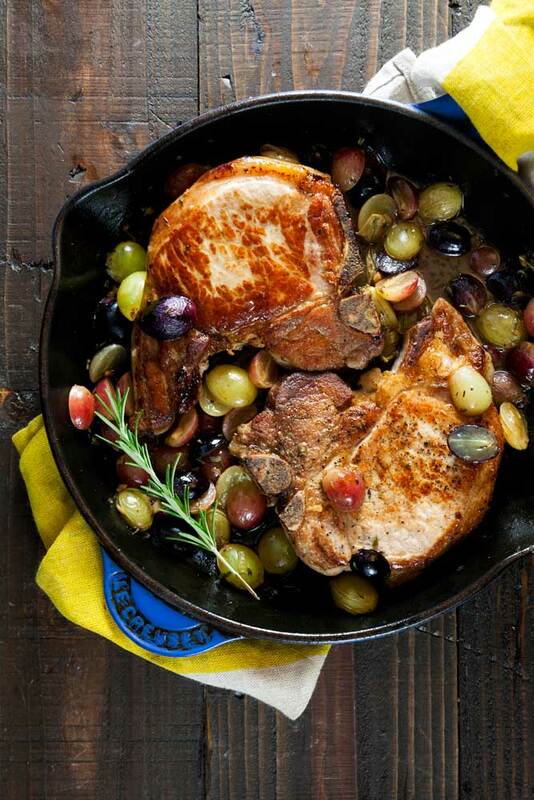 I’m totally cool combining meat and fruit in a dish, and these Pork Chops with Grapes? SWOON. So, so, sooooo good. Roasted grapes are the best! I’ve done them with chicken and pork. Love this recipe! I love those gorgeous grapes and such a wonderful meal for colder fall days.